My page rank is back! Thanks to all who helped me with this. The science fair is officially behind me! I think (almost) everyone had a good time. There are always people who just can't seem to be happy with the way something is run. I would really like to tell them to start their own science fair. I would totally come. And I wouldn't complain. I would just enjoy. But these people return every year to my fair, so maybe their way of showing me that they enjoy is to complain. Latrobe-Area Homeschool Science Fair. Coordinated and run by yours truly, but seriously, it's not that big of a deal. Boy 1 with his project board. Boy 2 with his project board. 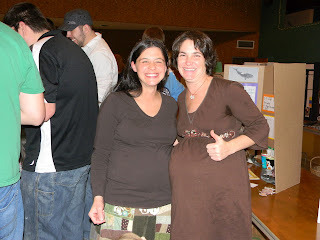 Something terrifying happened to me during the science fair. I was busy talking to people and coordinating 50 kids into their places. I was kind of aware of where my own children were, but not really. I was relying on friends and Michael to help keep track of them. At one point I thought, "Where is Margaret?" but then so and so came up and this and that and so and so had this problem. You get the picture. Finally it dawned on me that I hadn't seem Margaret in probably AN HOUR! She had been playing with my friend's son, but my friend had left. Had Margaret followed them outside? It was dark and 30 degrees. Where was she? I was in a daze as I walked toward Michael at the end of the hall. He also hadn't seen her and didn't know where she was. The search was on. It lasted all of two minutes, but those minutes could have been years. Margaret didn't know she had been missing, she had been with a group of kids and followed them into the planetarium show. Everything is fine now, but I still have an adrenaline rush as I write this. 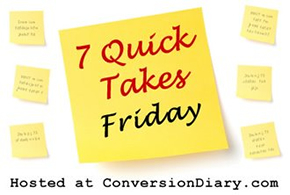 Read more Quick Takes over at Betty Beguiles, who is hosting for Conversion Diary this week.